These 18-year-old girls seem to have nothing in common. Except for the fact they're twins. Lucy is fair-skinned, has strawberry blonde hair, freckles and sparkling blue eyes. Brown-eyed Maria has thick, curly dark hair and mocha skin. All mic'd up, I've never been so nervous before in my life! 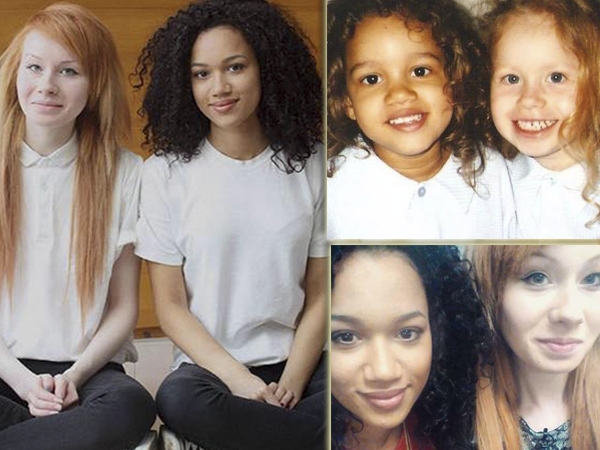 The beautiful Aylmer twins from the UK have become internet sensations since their story broke in a British newspaper. To clear up any confusion, the girls were born to a mixed race couple. Mom Donna (47) is half Jamaican and dad Vince (53) is white. When warehouse worker Donna gave birth to the girls in Gloucester in 1997 she was absolutely astonished. "It was such a shock for her because things like skin colour don’t show up on scans before birth," Lucy said in a recent interview. "So she had no idea that we were so different. When the midwife handed us both to her she was just speechless." The girls were Donna's fourth a fifth children, with older George (23), Chynna (22), and Jordan (21). Lucy says their siblings have skin "inbetween" hers and Maria's. "We are at opposite ends of the spectrum and they are all somewhere inbetween." "But my grandmother has a very fair English rose complexion, just like mine." At school, friends never believed the girls could be twins, and Maria and Lucy eventually showed them their birth certificate to prove it. "Even when we dress alike, we still don’t look like sisters, let alone twins." According to MailOnline, 'outgoing' Maria studies law at Cheltenham College, and 'shy' Lucy studies art and design at Gloucester College.